After several days of traveling, moving, unpacking and eating either Domino's or Cosi's at-first-yummy Tuscan Pesto Chicken (but turned tiresome after the third time), we treated ourselves to dinner at Raku down the street. Yes, it's a little sad that we could have just easily walked to any of the many restaurants in the area the past few days, but we were just too tired to leave the quasi comforts of our new place. One thing we noticed was that this was a neighborhood where everyone loved to eat out, and eat outside, regardless of what day it was - even on a Tuesday night. Many of the restaurants on or near the main strip were constantly bustling with patrons with the outdoor seating almost always full. It's quite the lively area. Raku is one of those restaurants - always packed. We enjoyed sitting at the sushi bar, watching not sushi being made (that was on the other side), but soups and salads, with the sprinkling different herbs, spices, sauces, etc to make an interesting presentation and the all important final inspection before giving the dishes out to the diners. 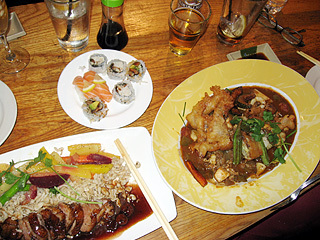 We feasted on fresh and tasty sushi, perfectly cooked and flavored duck, and a soft-shelled crab jambalaya, from their specials menu. I also had a sangria, that was a bit to strong for my taste, while Brian enjoyed some Yuengling - no longer an elusive beer for us.